Located directly on Boston Harbor and in close proximity to Downtown Boston and the MBTA, Boston East is a $71 million, boutique, mid-rise residential community that features 200 units, including six artist live-work-sell units and a community art gallery. The property was designed by Boston-based ICON Architecture, Inc. The interior of Boston East features designs by Cortney and Bob Novogratz, whose style has been showcased on HGTV’s Home by Novogratz and Bravo’s 9 By Design, and in collaboration with companies such as CB2. 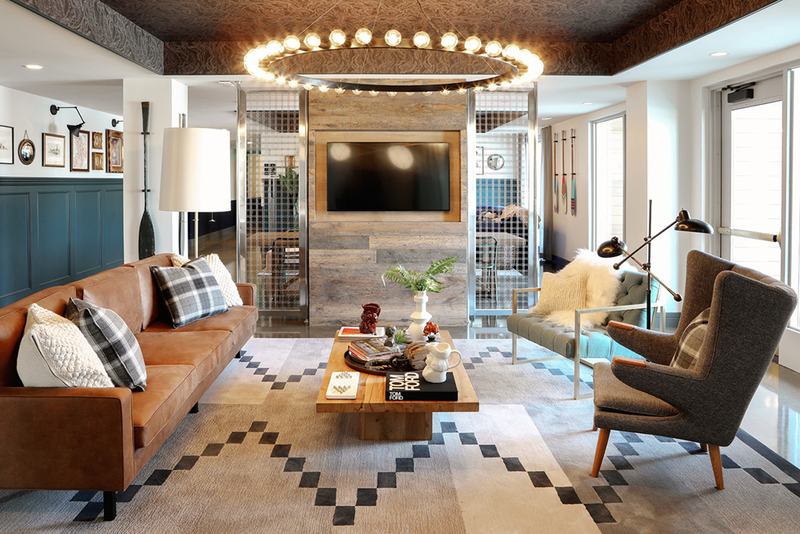 The pair has conceived some of the most unique and amazing living spaces across the country but Boston East is their first large scale multi-family design. The Novogratz’ have embraced the city’s history, the region’s seafaring heritage and the community’s location on the Harbor as inspiration for a “marine industrial” theme they incorporated into the interior design at Boston East. Last summer, Cortney Novogratz visited the Brimfield Antique Flea Market to shop for local pieces to be featured at Boston East. Design treasures from that endeavor include vintage lobster traps that create a coffee table in the public art gallery, a full-size antique canoe and a variety of vintage marine industrial pieces that have been woven into decor. Boston East’s exterior engages a maritime look, with wharf-like building wings extending to the waterfront and surrounding a central arched entry. Making the most of the beautiful Harbor and downtown skyline, light-filled apartments boast tall floor-to-ceiling windows with large decks angled out to catch water views. A richly landscaped courtyard and Harborwalk envelop the site, offering a gracious patio and fire pit overlooking the kayak and paddleboard launch. A spacious, glass enclosed rooftop lounge invites relaxation, while an indoor gym and dog spa encourage activity. “Recalling the site’s shipbuilding history, we have created amazing, contemporary residences that reimagine waterfront living in Eastie,” said Nancy Ludwig, Principal of ICON Architecture, Inc.
Boston East officially opened on April 1. Trinity Management, LLC will serve as Boston East’s professional property management company. Located directly on the waterfront, near Maverick Sq. and Central Sq., Boston East is a $71 million boutique mid-rise residential community that features 200 units, including six artist live-work units. Boston East allows residents to engage the waterfront through a kayak and paddle board launch and experience uniquely designed apartments and amenity spaces with striking water views.